In May, I had to change doctors. My new doctor didn't really trust my observation that eating gluten caused my vitamin levels to drop. She really didn't even believe me when I told her that I had been diagnosed with a vitamin D deficiency that caused me to have many neurological problems. She wanted to know if someone had told me that. When I replied that a neurologist had, she refused to believe me until she got the neurologist's report. Sadly, this is not the first time I've run into this. 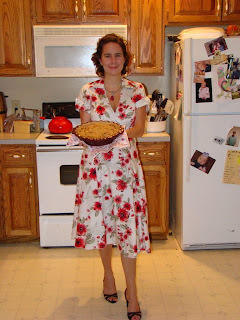 From before the gluten free diet- Great apple pie recipe, by the way. The sort of insurance we have seems to make doctors drop it on a regular basis. During the 6 years we've lived here, I've had four doctors. Each time I move to a new doctor, it seems like I am starting anew in my search for health. After all, none of the previous doctors have been willing to diagnose me with a gluten intolerance, preferring that I just do my own thing, especially since I wasn't willing to go back on gluten so that I could be tested. I was tired of the attitudes I got from doctors and decided I'd had enough. I went back on gluten and demanded that I be tested. The gastroenterologist told me that even if I did not have Celiacs, he would recommend that I never eat gluten again. Finally, I get a doctor's note to show my other doctors. But that month on gluten reminded me how awful it had been before I went gluten free, and I thought I would share what I go through when I'm on gluten, and when I detox from gluten. By a week into eating gluten, I was hurting. My feet hurt. My knees hurt. My hips hurt. My arms hurt. My back hurt. Everything hurt. I had forgotten how much I hurt when I eat gluten. Over the previous two years, I had begun to take for granted being pain free. No more. I am living with pain all the time right now. A few days in and I was having to urinate more frequently. I was waking up multiple times a night to go to the bathroom. This was a symptom I had not previously attributed to gluten consumption. I just put the reduction in nightly bathroom visits down to retraining my body. *ahem* I was wrong. Not getting a good night's rest is definitely not helpful. Two weeks after I started eating gluten, Gary and I'd both had enough. Gary was worried about me, but I was just tired of being sick. I was also at the stage of my gluten consumption that I was beginning to experience neurological problems. My vision was getting worse. My fine motor skills were getting bad. I couldn't remember things. My balance was off, and I was slurring my speech. Gary likened me to a drunk person. That's how it feels, too. I'm sure that had I chosen to drive during that time, I would have been arrested for drunk driving, if I didn't kill someone first. My reaction times are slow. I can't process more than one thing at a time. If it is too noisy, my brain basically shuts down. It is an extremely frustrating experience. I called and scheduled another appointment with my skeptical doctor. She was not available, but there was another doctor who could see me. I was desperate, so I said yes. This doctor had never met me before. She didn't know that my slow, slurred and stuttering speech was not normal for me. She didn't know that I shouldn't have been having trouble to stay awake to talk to her. She was skeptical that gluten was causing me these problems. But, since I had some typical gastrointestinal complaints, she was willing to give me a referral. When I got home, I took vitamin D3 immediately. Gary called it "taking the edge off" and it did. Take the edge off, that is. Vitamin D alone won't get rid of my problems, but it certainly helps. It takes a combination of being gluten free and Vitamin D to get rid of my problems. I'm thrilled to be doing that now. Oh, but detoxing. I can honestly say that for me gluten is an addiction that my body must detox from. Today is the third day of my detox. I want to share with you what my experience has been like. Day 1: 9:00- I'm doing good. I just got my gluten fix last night. Lots of yummy bread and cookies. I can do this. It'll be fine. I'll be fine. I know I'll feel better. I've been miserable for the last month. I know that gluten kills my body. 3:30- We stop at Starbucks on our way to the grocery store. We go through the drive through. It is painful for me not to get a pastry, but Gary tells me no. Had I been alone, I'm not sure I would have been able to resist. 9:00- I go to bed early because I'm craving gluten so bad. Day 2: 9:00- I'm starving. I get my baked good fix by making gluten free pancakes for breakfast. This fools my body and brain for a good long while, about two hours. 11:00- I'm starving. I'm crying because I'm so hungry and I don't know what to eat. Gary goes in the kitchen and starts cooking. I don't want any of it. It all sounds disgusting, and I am nauseated. I'm yelling at people for no apparent reason. I'm stomping around the house. I end up eating hot dogs without buns, gluten free pretzels, and 2 gluten free quesadillas. All is good in my world again. 1:00- I'm hungry again. I chow down on gluten free yogurt covered pretzels. Sure, protein would keep me full longer, but that's not what my body wants. I have learned to try to give it what it wants. Otherwise, it may just come back up. 2:00- We head out to a friend's party. This is good. Distraction is good. We take the gluten free pretzels. I start eating them as soon as we arrive. I play with the babies. That helps distract me. I want desperately to eat those hamburger buns, but I stick to a hamburger patty, salad, and gluten free pretzels. 5:30- There are so many delicious looking desserts. I want them so bad. I eat more pretzels and Gary decides it's time to leave. We stop at the grocery store on the way home for gluten free brownie mix. 9:00- Gary and I are at a movie. Popcorn and Coke help alleviate the gluten cravings. I'm able to go to sleep as soon as I return home. Day 3 today: 9:00 So far, so good. My body seems to be detoxing pretty quickly. I make gluten free muffins for breakfast. They're delicious and I seem to be taking longer to feel hungry. 2:00- I finally need to eat again. Gluten sounds good, but I eat gluten free quesadillas again. They're quite tasty, and, more important, fast. 3:00- I go to the store to pick up some things for the dogs. I stop at Starbucks again. I want that pastry. I am able to resist it without the severe strain it put on my body on day 1. 9:00- I'm tired, but not like I was a week ago. This is a healthy tired that comes from having a full day, not from eating the wrong food. The pain is still there. My feet and knees hurt. My left hand hurts for some reason. It'll go away. It always does. I am always in pain when I eat gluten, and the first couple weeks I am off gluten seem to intensify it. Perhaps that is because of the emotional strain detoxing puts on me. It is easier for me if I don't leave the house during the detox period. There is less temptation. I have to change my habits to avoid those places that cause triggers. It is also easier if I have good replacement foods for my favorite gluten foods. That is why Gary and I went grocery shopping Day 1. We wanted to be sure I had enough food on hand to give me a wide variety of choices. It is difficult when your stomach is rebelling and acting like a dramatic child gagging over something it prefers not to eat. Detoxing is no joke, and I'll be happy to never have to do it again. If you know someone who has a gluten intolerance, Celiacs, or some other food allergy or intolerance, please be patient. Remember that they don't have this intolerance to make your life inconvenient. It is much more inconvenient for them, believe me. If you plan to go out together, plan to go somewhere that serves gluten free food. Don't try to get them to go to a pasta place where the only thing they can eat is salad, and even that might have the hazard of cross contamination. If they tell you they can't eat that treat you bought for them, please don't make them feel guilty. They just can't do it. And, remember, they need you to treat them with compassion, especially during the early stages of them adjusting to a life without. It's not easy learning to live without. Friends and family can make it easier with compassion and humor. Edited to add: I just got my results from my genetic testing back. I am positive for Celiacs. I can now live in peace, gluten free. It always amazes me how strong you are. I'm proud of you for being strong and am glad that you finally got the diagnosis we both know you should have had years ago. Kristina, so sorry you had to go through all that, that you had to get sick to get someone to listen. If you need anything, let me know. How frustrating to know what is wrong with you and have a doctor not believe you. I sort of see their position that there are a lot of hyperchodriacs that self diagnose, but sheesh! Have you tried the black bean brownies yet? they might help your "fix" :) leave out the coffee grounds and I am sure they are still delicious.